Some of the fondest memories of a comic book reader are peeling off the plastic wrap off of the comic book and turning the cover page. That sound of fresh paper rattling still makes us a little giddy inside. As much as we hate to admit, digital books are the present and the future. The purists still believe that nothing’s better than the feeling of a physical book in the hand and the sound of the rattling pages is unparalleled. But, the success of Kindle and reading apps tell us a different story. The handiness of a small gadget essentially carrying your whole library is too good a deal for avid readers to not look into. The comic book readers have long been waiting for a solid platform to satiate their digital comic book cravings. 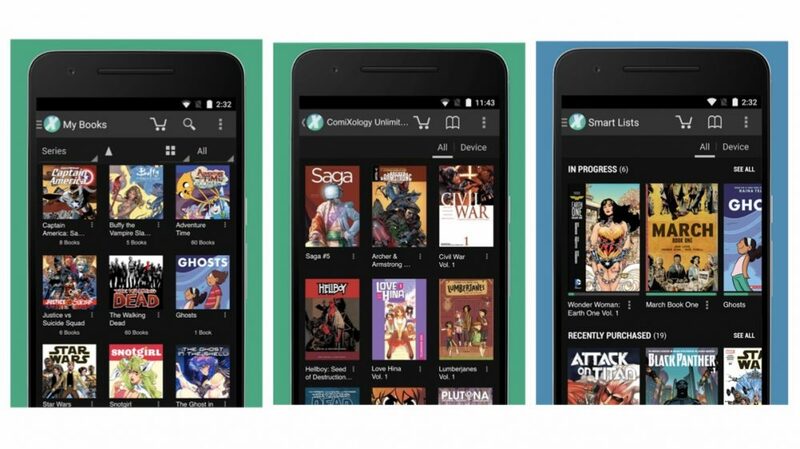 We went on a spree to find you the perfect app for comic books and boy do we have a good one! Comics by ComiXology is all you’ll ever need and it is great. With a collection of over 75,000 graphic novels, comics and manga this is your one true flight-mate.The collection is mostly paid but there are a few free comic books to get you started. As is with every app, to access the full library you need to buy the books and read them offline while you are on a flight or a place where you can’t access the internet. From Archies to DC and Marvel to Appleseed, the collection is huge and it’ll take you the long time to even try and finish reading the whole library. Another important box that this app checks out is the UI. An easy-to-use app with proper refined categories and an easy payment method makes using the app an absolute walk in the park. It has all the necessary tabs to help you find the comic book you’re looking for. The text is crisp and the images are sharp to keep you immersed in whatever you’re reading. Available for free, this app is a must-have for all you comic book/graphic novel enthusiasts who travel a lot and can’t afford to give up the precious space in your hand-baggage. This handy little app will soon become your go-to saviour from the perpetual boredom. Check out the app below and tell us what you feel about it!